Everyday, I'm shufflin'. Baby, job, feeding my Lifetime movie habit, baby, hanging out with the hubbie, baby, impromptu trips to the thrift store where Ruby refuses to stay in the cart. . . whew. I'm ready for a party! You with me? Good, because I've got super-exciting news. 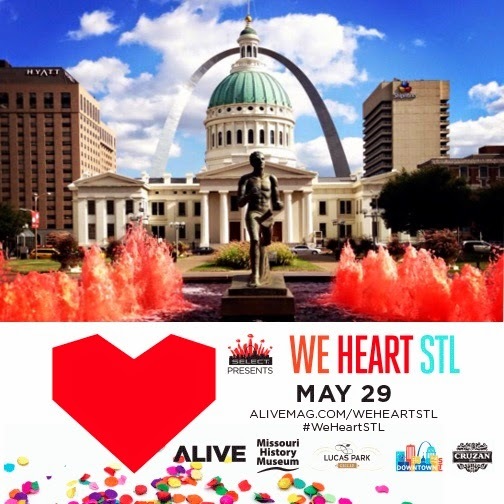 The Ruby Zipper has teamed up with ALIVE Magazine to offer 2 free VIP tickets to the hottest fete of the season: We Heart STL Best of the City Celebration! In addition to filling up their cups with Bud Select and Cruzan Rum, guests can shake that to live music from The Free Years, shop from local vendors, and ham it up in Sara's Social Booth. Did I mention there will be food from yummy local spots like Lucas Park Grille? Yeah, party rock will be in the house - and you don't want to miss it! The best way to roll at the celebration is VIP. You get early entry at 6:30pm, free cocktails in the VIP balcony, and a $15 gift card to Central Table. Of course, you don't want to party alone, so invite your friends to the We Heart STL event on Facebook. Follow @ALIVEMagSTL on Twitter, Instagram, and Facebook for up-to-date info and use the hashtag #WeHeartSTL to share what you love about St. Louis! Good luck in the giveaway! Can't wait to see you there! I like to go to the Muni, Shakespeare in the Park, LouFest, July 4th in Forest Park, Concerts at the Botanical Garden...so many things to do! Those are all really fun places. Loufest has an awesome lineup this year. Thanks for your comment! I love getting naked and taking pictures! Oh, June, you naughty girl you. LOL :) Thanks for your comment!